Philly has great trails around the city, but the areas where the trails and car infrastructure meet, cross, or mix are often problematic. We provide some infrastructure for bikes, but that infrastructure disappears completely when we come to intersections. 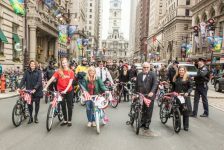 I recently read Kidicalmass organizer and Philly Pedals author Dena Driscoll’s blog post, Last Half Mile Home. Dena lives in a big bikey area. She lives between the Schuylkill River Trail, the trails of the Wissahickon Valley, and nearby Manayunk Towpath, all sections that draw many cyclists. This same area is also has a regional rail station and bus transfer station. Heavy traffic also comes to the area from I-76, City Line Avenue, and Kelly Drive. Rail commuters, heavy buses, pedestrians, cyclists, and drivers come together in a congested space where cars move fast, hills are steep, sidewalks are narrow, and there is no designated bike lane. Image via Google Maps Traffic conditions: drivers are moving fast. Also note, the dark green line indicating the trail looks like it has a separate bridge crossing. In reality it is a narrow sidewalk along a bridge. Ah, Google Maps, you are a prankster! One of the few signs for cyclists. Dena had to drag a cargo bike through the snow to cross to the other side to reach Ridge Avenue this winter. Photo credit: Dena Driscoll. I talked to Dena about what she has experienced and observed and then I took a ride up there to get a feel for the intersection. She said (and I would agree), The confusion is high! On the first nice days it gets confusing. I have had run-ins with other bikers biking wrong way in the street trying to figure out how to get to the towpath. I asked Dena how she learned how to navigate the trail end. She said, I learned how to do it by watching other bikers and going with what feels safe. I know from stroller usage that the westbound sidewalk is too narrow for that, let alone bike. I know cars will run the light and I need to wait longer to cross. It’s even worse with the bad weather. They don’t clear the trail at the end. No curb cuts are cleared. The empty buildings don’t shovel walks. It’s batty. I don’t know if the area can be made better for bikes. There is not much room to create a specific place for bikes in the road. The trail has to be completed and linked to avoid this whole mess. Plans have been in the works, for some time, to link the trail and bypass this intersection, but there is no wayfinding or temporary measures to help cyclists safely navigate this area until the trail is linked. Bike riders use this area not because they want to but because they have to. The trail is like a highway for bikes; it is the least hilly and easiest access between suburban Philadelphia and Center City. There are some trails on the west side of the river, but they are not as direct and have more hills. 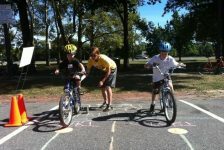 Besides the trails being an access point between the city and surrounding community they are great for recreational cycling and link to fun locations and historic sites, like Valley Forge. For people like Dena who live near the trail and use it to get in and out of the city, linking the trails might lengthen her route but provide a safer and less congested place to access the street network. 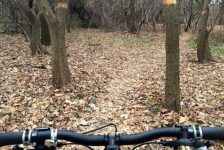 For those who want to enjoy the trails there needs to be a safe way to get to them.